Which one is first, rules or principles? I received a Kendo Nippon magazine, Issue No. 468, the featured article is, “Improving Shinpan Skills”. Shinpan means referee if you are new to the term. The article was written based on interviewing Masatake Sumi sensei (8-dan). So some explanations are subjective to Sumi sensei’s view on how shinpan should be. Like I mentioned, the speed of strikes in kendo has become amazingly fast. It is nearly impossible to actually “see” the direction of the shinai of a competitor. So Sumi sensei is explaining using a bokuto, that you should see the “posture” of a competitor when executing a cut. We know which part of the shinai we should strike with, correct? The part is called, monouchi”. We’ve got to start from there to know what kind of posture a competitor should have because you need a certain distance to strike properly with monouchi. And the shinai for adults is a lot longer than the bokuto. That means you need more space to strike “properly” with the monouchi. Sumi sensei also mentions the “reaction” time of referees. He calls it the “timing disease” because the referees tend to “respond” to cuts too quickly. What is “too quickly”? They tend to give a point as soon as a valid cut is made (or at least they thought it is valid). So there is no time to check the posture of a competitor and zanshin either. “We need to have a moment to review the elements of the strike that the competitor has just executed”, he continues. “As a result, it looks like that the referee looks delayed to make his decision compared to the other two if the other referees gave the competitor a point right away. But it is just reviewing the elements of his/her strike”. I could not agree more. Otherwise, kendo would become a real hitting game. Shinpan is really hard to do. If you have experience in that area, you can agree with that. That is why we really need to LEARN and STUDY to “judge” the right strikes. I understand the argument of “it should not be valid if you do not ‘hit’ a target with the monouchi”. I do understand. However, we have the other elements to consider as well. There are three referees at a shiaijo (the are of a match) watching not only who hits whom but also whose doing what and how. They are FEELING the energy between the competitors. That is a huge difference between the referees and audiences who also can watch a replay. So introducing a video judgement in kendo won’t solve this problem and we should not introduce it because then it really become a “hitting” game. Think about Kata No. 3 of Tachi and even Kodachi. Shitachi does not execute a cut on uchitachi but it is obvious who wins. This is a ultimate victory because you do not kill or hurt anyone. However, this is not a point in shiai. If you do that and your opponent hits you, your opponent gets a point Then why am I bringing this up? Those katas are teaching us not to hurt others and also how to suppress our opponent. There is a process to put your opponent to the corner and at the end you stop your opponent from fighting you. In kendo, this is probably the main part than actual “hitting” part. This is only my personal view. That is why there is a story that a 9-dan sensei admitted his loss by just being taken his center by the other 9-dan sensei. We see the process that leads to an execution of a technique very important. 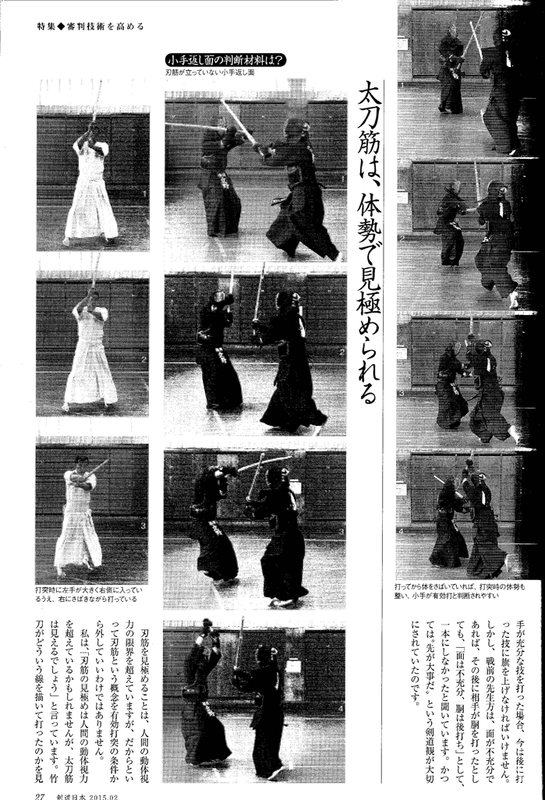 This is something we should not forget in kendo. If we consider a situation (what’s going on) before, during and after a strike as a part of requirements of a valid cut, many so called misjudges can be explained. I agree that we must “strike a target” for a valid cut but I also want to keep the idea of Kata No.3 in the kendo match as well. Who is putting more pressure on whom. This is really hard to tell unless we read people’s mind. And we cannot (I cannot, at least) so we must rely on the experience on shinpan. A valid cut is just a mere hit any way. I would like to watch for the path Kendo will take from now on. Home > Thoughts on Kendo > Which one is first, rules or principles?